Just ME: Avery Elle spring release blog hop! welcome to Avery Elle's spring release blog hop! I'm showing off Peek-A-Boo Pets, as well as the Market Stand stamp sets. I love them both so much! I get the feeling this fluffy sheep is a real ladies man, haha. 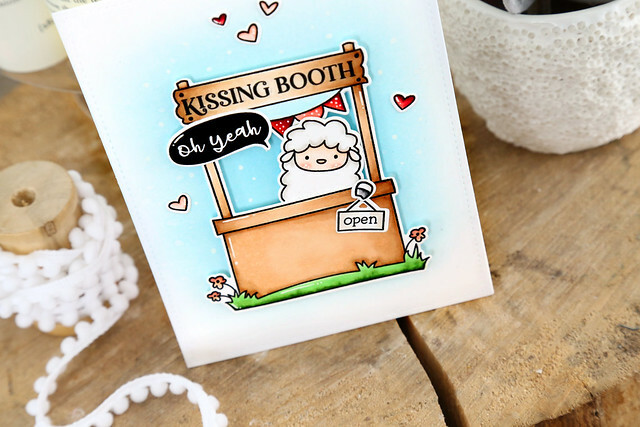 With his one hoof hanging over the front of the kissing booth stand, highlighting the "open" sign. I was giggling to myself when I glued down that "oh yeah" speech bubble. Be sure to check out their entire spring release, it's all so good! CLICK! Follow Avery Elle on Facebook (www.facebook.com/AveryElle ) and share us with your friends - make sure they tell us you sent them. Follow Avery Elle on Instagram (we are https://www.instagram.com/averyellestamps/). SWOONING Over the NEW Products and your SWEET Card!! Peek a Boo Pets and Market Stand are my FAVORITES!! THANKS SO MUCH for sharing and have a FABULOUS WEEKEND!! I'd kiss that cutie in a heartbeat!! hehe So adorbs!! This is so adorable, Elena! I love how well these two sets pair up!!! And I love how he's holding the "open" sign!!! CUTENESS!!! the kissing booth is a fun idea. Ha! This one made me laugh! A real Baaaad boy! So cute. Love the "oh yeah" sentiment. What a funny card! I love how this sheep is thinking he's all that! Cute as can be! I love the Market Stand and the adorable Peek a Boo Pets! Awesome new designs! Love, love, love the peek-a-boo stamps! This is really cute, Elena! The sheep is my favorite of the Peek a Boo Pets. The kissing booth and that sentiment are very clever! Love, love, love this card. So darn cute! Oh, how adorable! Wonderful design as always! Perfect Valentine card for that special someone! 1.Awww!!! How cute!!! Adorable card!!! Avery Elle new release is awesome! This card just makes me giggle. So cute! A really cute card. Love the kissing booth. This is sooo fun! 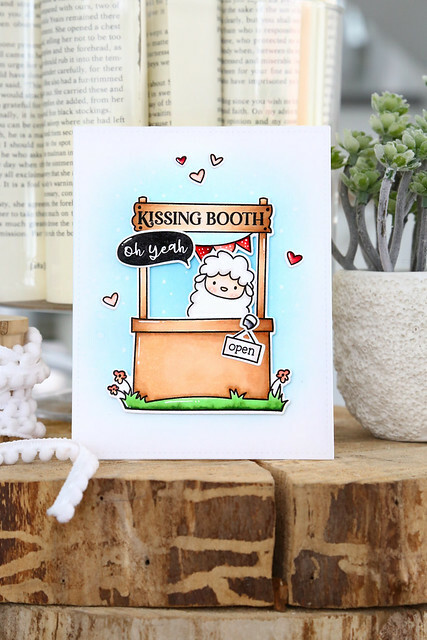 A kissing booth colored perfectly! This card is too funny and cute! haha - love this - so FUN!!! The booth stamp set is very cute! Your card is pure delight. Market Stand is one of my fave sets in this release and you've showcased it beautifully. Such a sweet lamb. Your coloring is lovely. Hey, there I like to just suggest something I found interesting to read about different pipes.